This injection well site is way too near a family home and an airport in Vienna, Ohio. This site is too close to areas of known, man-made injection well–related and fracking earthquakes in the region. Frackfree Mahoning Valley is calling for Ohio Governor John Kasich and ODNR Chief Simmers to protect the public health and safety of the Vienna and surrounding communities by immediately halting plans to allow what FMV believes to be ultrahazardous, heavy industrial injection well operations in this community that already has experienced an injection well-related spill in 2015. FMV says permitting injection at this site will increase the risk of induced seismicity. Earthquakes cannot be regulated, says FMV.Youngstown, Ohio, August 11, 2016 – Frackfree Mahoning Valley (FMV) is calling for Ohio Governor John Kasich and Ohio Department of Natural Resources (ODNR) Chief Simmers to immediately halt three local injection well sites in order to protect public health, safety, and well-being and to decrease the risk of more man-made earthquakes and risks to drinking water that can result from injection well operations. “We came so close to winning last time that we fully expect to win the vote in November. In this past May’s election, we only needed 8 percent more to pass the Community Bill of Rights charter amendment. We had almost 3,000 Youngstown voters who did the right thing by voting Yes, and that is very impressive and very good news. We thank them,” said Youngstown resident Lynn Anderson. The group believes that the increasing number of high-profile scientific findings, government reports, news reports and claims by people living near fracking-related operations is awakening more and more people to the need for a Community Bill of Rights to help Youngstown prevent dangers, civil rights violations, and risks associated with fracking and related processes, infrastructure, and millions of gallons of fracking waste. “Nationwide and locally there are unconventional fracking wells and heavy industrial infrastructure that are way too close to homes, schools, parks, cemeteries, farms, and forests. Millions of gallons of our precious drinking water are being made permanently unusable due to the massive amounts of water used to frack each well. Each well pad can have numerous legs that can also be fracked. How can these heavy industrialized operations be permitted so close to homes, farms, or residential areas? This is not right. We need local control to protect our community’s public health and safety and to enforce how we want our communities to be. 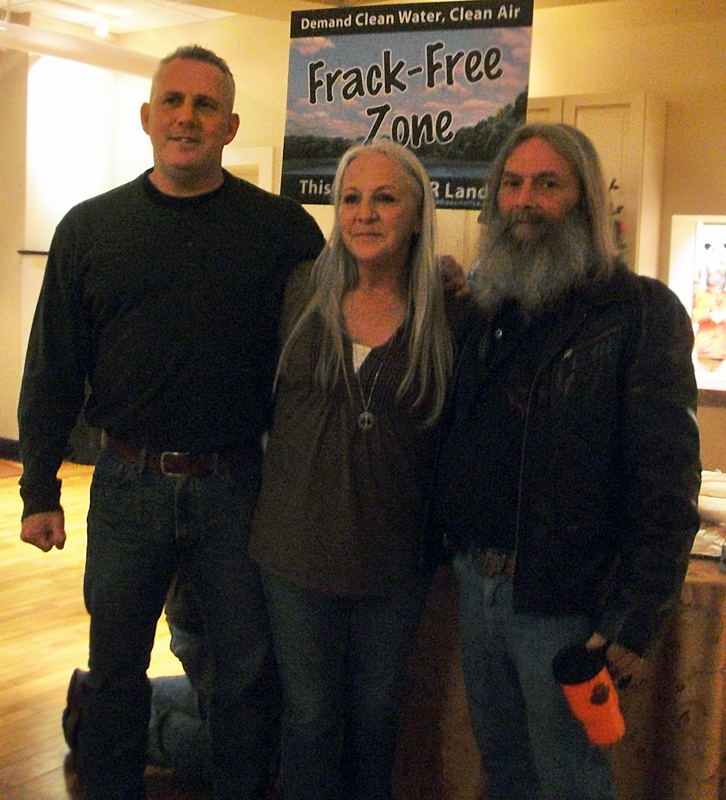 When the Community Bill of Rights passes in November, 2013, fracking and related activities will be banned in Youngstown as violations of the community’s fundamental rights,” said Susie Beiersdorfer. The Community Bill of Rights Committee points to unconventional fracking going on in the protected area of this local region’s drinking water, a source for at least 200,000 people as a risky activity and one that should never have been allowed to occur. They wonder how the state could have permitted fracking operations so close to a source of drinking water, our Meander Reservoir Drinking Water Source Protection Area. “Think about it. What if this was your mother, grandmother or another family member being forced to endure this unfair and unhealthy situation? We need to protect our loved ones from this kind of unjust intrusion and threat to public health, safety, and well-being. This is America. We can do better than this. In America we all equally deserve liberty and justice – fairness is not just for the few, “ said Susie Beiersdorfer. The Community Bill of Rights Committee and supporters say that a Yes vote will protect our inalienable rights and clarify that local elected authorities do indeed have the power – and the duty - to protect their constituents’ public health, safety, and well-being, and families in their jurisdiction. The fundamental rights of local communities cannot be legislated away by state governments. The Community Bill of Rights will be a much-needed return to the rule of law. The group will soon announce a newly revised website where visitors can volunteer, donate, or get further information about the Community Bill of Rights. Concerned citizens of Frackfree Mahoning Valley and Guardians of Mill Creek Park are urging the public to attend an important public meeting on October 25, 2012, at Mill Creek MetroParks Farm 7574 Columbiana-Canfield Rd. Canfield, OH 44406 from 6:00 PM to 8:00 PM. Scheduled speakers at the October 25th meeting are: Ohio State Representative Bob Hagan, Dr. Ted Voneida (neurobiology), Dr. Ray Beiersdorfer, Ph.D, professor of geology. Dr. Voneida and Dr. Beiersdorfer will speak about geology and chemicals that are vented at fracked wells and the adverse effects they have on the environment and health. “If you care about the park and our surrounding area, we urge you to please come and hear the speakers and voice your concerns to stop fracking from destroying Mill Creek Park. For the residents who live near the park, this is a matter of keeping drilling rigs out of their residential living space. Fracking and related processes jeopardize the public health and safety and are not in the public interest. To permit fracking related drilling near homes, schools, parks, cemeteries, or forests is simply unconscionable and must be stopped. Evidence that some officials are not protecting the public interest is the astonishing news that a fracking well has been permitted about a mile from a nuclear facility in Shippingport, PA, “ said Lynn Anderson, co-founder of the Facebook group Guardians of Mill Creek Park http://www.facebook.com/groups/guardiansmillcreek/. Frackfree Mahoning Valley says it is important that park commissioners and the public fully understand the high risk of leaks, spills, mechanical failures, drinking water contamination, and earthquakes associated with fracking and related processes. Even before fracking ramps up in this area, there have been accidents, including the 5-mile long so-called “brine” waste spill in Fowler and the fish kill in Brookfield. 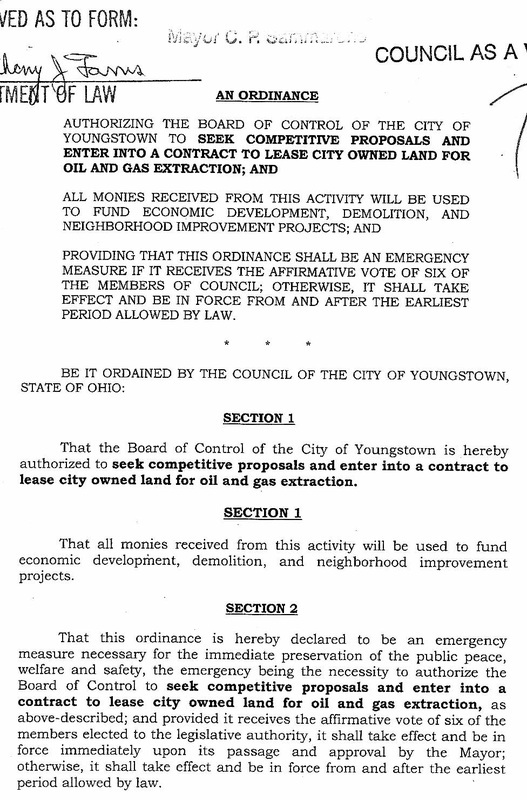 On September 19, 2012, some members of the Youngstown City Council wisely postponed the vote to greenlight fracking in the city of Youngstown, perhaps, out of their legitimate concern for the need for more due diligence, transparency, and public education before leaping blindly into a serious decision that would affect Youngstown and the surrounding area – including other states and Canada. Delaying the vote was the responsible thing to do. Thank you. This issue is not over even though the vote was postponed. Now the vote could be set for October 3, 2012. We must again urge the Youngstown City Council to vote to delay the vote and to hold a series of public hearings, preferably televised, on the topic in question. For the record, Frackfree Mahoning Valley, a group of concerned citizens from Youngstown and the surrounding area, opposes fracking and related processes since fracking cannot be done safely with the technology as it stands today. As the old saying goes, desperate people do desperate things, and we believe that putting the public interest, health and safety in jeopardy in order to recklessly rush into an agreement for fracking, because it is said that the city needs money, is a desperate thing to do, even if the intentions of the Mayor are good. Other, more creative ways to solve this problem should be explored. Furthermore, Youngstown, Ohio is the current epicenter of induced seismicity, otherwise known as man-made earthquakes. To even consider allowing fracking within the city limits is astounding in light of recent history. Allowing fracking in the city will increase the production of millions of gallons of toxic fracking “brine” waste which may be disposed of in toxic “brine” fracking waste deep injection wells in the Youngstown area, which is now an earthquake zone due to previous injection that disturbed the equilibrium of an ancient fault. People were shocked after the 11 earthquakes leading up to the 4.0 magnitude earthquake, and rightly so. Mayor Sammarone was “worried,” according to the CNN report. We should not forget how we, as a community, felt at that time. We should question the wisdom of allowing fracking and more injection well disposal of “brine” toxic fracking waste in this area. Frackfree Mahoning Valley understands that Youngstown, like many cities nationwide, is in a budget crunch, but a better solution than greenlighting fracking should be found. For the sake of the Youngstown community, families, children, grandchildren and future generations, we must get this decision right. There must be proper due diligence, public awareness and transparency. We are concerned that this still has not yet taken place. Not all designated experts on hydraulic fracturing (fracking) are objective or impartial providers of vital information that the general public needs. 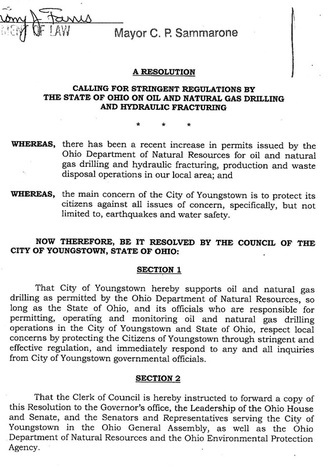 The Youngstown City Council’s decision must be scrutinized, publicized, intensely deliberated, and voted upon by a fully informed public, because not only does this decision profoundly affect Youngstown families and community, it is also a regional issue, and an international issue, since any resulting earthquakes from toxic fracking waste deep injection wells have the potential to be felt in surrounding states and even Canada, as shown by the reports from the December 31, 2011, Youngstown 4.0 magnitude earthquake, one of about 12 earthquakes in an area with no previously recorded quakes prior to operation of the Northstar # 1 injection well. Frackfree Mahoning Valley offers our educational support for putting together a public, and it is hoped, televised forum where the community and surrounding states can hear what is being considered and where they can hear truly independent authorities on the risks and alleged benefits of fracking. Where will the millions of gallons of toxic “brine” fracking waste that will necessarily be created by allowing increased fracking within the city limits, be disposed of in the Youngstown area? What are the planned locations for injection well disposal of toxic fracking waste? Where will the fracking industrial operations and drilling rigs actually be placed in Youngstown? How close to homes, parks, schools, cemeteries, forests, or sources of drinking water will they be located? Already, drilling is set to commence near Meander Reservoir, a source of drinking water for 300,000 people in the Youngstown area. This is an extremely unwise and irresponsible decision. Can we expect more decisions like this if drilling is greenlighted in Youngstown? Earthquakes linked to the Northstar #1 fracking waste injection well have already taken place. What is the effect of even small, frequent earthquakes, like the ones already experienced in Youngstown, on the ability of the injection wells to maintain well integrity and protect drinking water sources? Who is testing the integrity of the injection wells and how often? What is the likelihood that drinking water sources will be affected or contaminated? Where is the plan for Youngstown to protect water sources from fracking operations? What will the increased truck traffic do to our quality of life in Youngstown? Where is the plan for preventing expensive road damage in Youngstown which could run up an enormous bill for Youngstown taxpayers? See the following video from Pennsylvania that shows increased truck traffic in one city. “Drilling trucks have caused an estimated $2 billion in damage to Texas roads" By Barry Shlachter, Star-Telegram.com. This list of relevant and necessary questions could go on and on. Public input is needed. What do the constituents want to know about what may take place in their neighborhood? 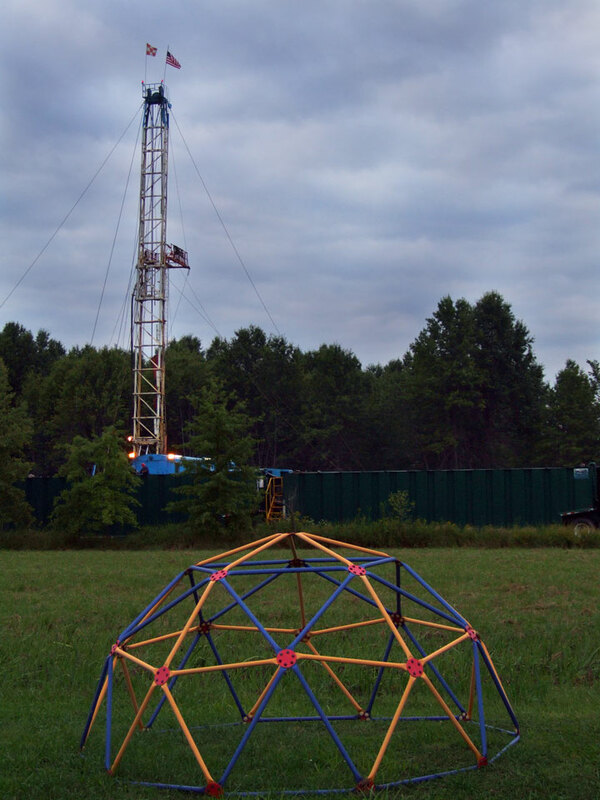 What are the risks associated with fracking and related processes? They deserve to know before it happens, and to have a say in what might happen in their local community, although Frackfree Mahoning Valley believes fracking should not take place for reasons cited above. Frackfree Mahoning Valley sent an e-mail (a copy of the e-mail message is included below) to Youngstown City Council after the Public Utilities Committee meeting on September 18, 2012 where a representative from the Ohio Oil & Gas Energy Education Program (OOGEEP) spoke to them about hydraulic fracturing (fracking). 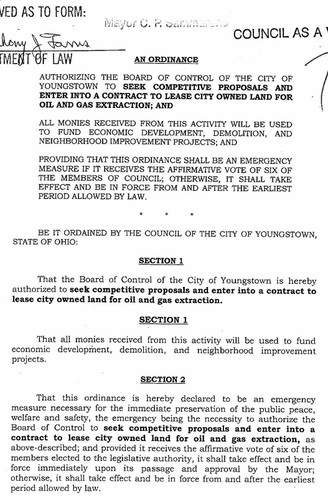 There were some presenter omissions and, we believe, inaccuracies, that need to be addressed as a part of adequate due diligence before Youngstown City Council makes such a serious decision about leasing Youngstown’s mineral rights for fracking. In addition, when asked by a City Council member about earthquake issues, the OOGEEP presenter urged Council to ask the Ohio Department of Natural Resources (ODNR) about earthquakes because she could not answer those questions. As far as we know, a public meeting with an ODNR official about the unanswered questions has not yet occurred. There must be time allowed to invite ODNR, as recommended by the OOGEEP presenter, and to do the requisite due diligence to protect the public interest. Again, the e-mail sent to Youngstown City Council by Frackfree Mahoning Valley is shown below at the end of this statement. To open up Youngstown for fracking is a serious decision that should not be rushed into lightly or recklessly, as now seems to be the case. What kind of mess are we leaving for our children, grandchildren, and future generations to clean up if we allow fracking to continue? We as a community must stop this reckless pursuit of money, at any cost, before it causes irreparable and irreversible harm to the public health, safety and well-being. Negative health effects may not manifest right away – sometimes taking years, but that doesn’t mean that adverse health effects are not taking place. There is a great need now to hear from physicians, nurses, and other public health and medical professionals about their assessment of the risk of adverse health effects of fracking and related processes. To date, we know of no medical professionals that have addressed Youngstown City Council. Why? This needs to happen. We owe it, not only to ourselves, but also to our children to make the right decision regarding leasing mineral rights. Youngstown City Council members are entrusted to represent and to uphold the fundamental, inalienable rights of their constituents to clean air, clean water, and land. Council must take the required time to protect the well-being, public health, and safety of our community and its families and future generations. It is their duty. Delay the vote. Increase transparency and increase valid due diligence. Truly educate the public by holding televised true public, honest dialogue and a series of public hearings with independent, objective experts, physicians, public health professionals, citizens, and authorities. We cannot jeopardize the public health for some quick cash. This decision could forever change our local area from residential or rural to heavy industrial. Does the community really want that? We think not. How can voters make an informed decision about whether or not to allow fracking in their neighborhoods if polls reportedly show that many people (62 percent in one poll) don’t even know what fracking is? They can’t, which is why there needs to be a valid public awareness campaign in the public interest, and fast. We believe that when the public genuinely understands the consequences and detriments of fracking, and not only the alleged benefits touted by those with vested interests in perpetuating fracking and related processes, they will join the anti-fracking side of the argument in large numbers. After making objective fracking information available to the public, a vote should be put on the ballot for the public to decide for themselves the nature of their local community. After the public is truly informed about the damage fracking and related processes have caused in other states that are further along than Ohio in the process, they will be in a better position to make a real, informed decision regarding the risks and “benefits” of fracking. The truth about fracking risks is not the rosy picture that is painted by slick, expensive gas and oil drilling advertisements that are broadcast continually on national and local TV and radio. 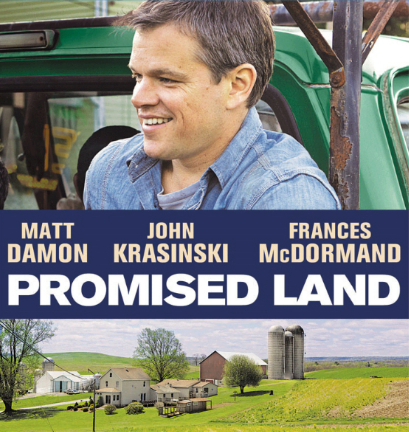 These overly optimistic and, we believe, disingenuous portrayals, which neglect to tell the public about the high level of adverse risks of fracking and related processes, are simply too good to be true. It is also irresponsible and a disservice to the community to only present the alleged “benefits” of fracking while failing to present known detriments and risks of fracking and related processes. Why is the industry, apparently, avoiding or evading discussion of the risks? The general public, and members of Youngstown City Council, deserve to know the risks in order to make a truly informed consent or rejection of fracking and related processes in their neighborhoods. It is the responsible thing to do. There is also a link to our open letter of September 18, 2012, to Youngstown City Council at the website URL cited above. Thank you for the opportunity to ask questions of the speaker last evening. This is a good step forward to the kind of dialogue that we would like to see among experts, scientists, physicians and public health professionals, council, and the general public. There were a number of inaccuracies and omissions in the presentation by Ohio Oil & Gas Energy Education Program (OOGEEP) to City Council last evening. The presenter also was unable to answer several questions regarding the Youngstown injection well-related earthquake. She referred Council to ODNR. We hope that you will please follow-up on the earthquake, fracking waste, and injection well questions that were left unanswered by the presenter last evening. This is a very important topic for Youngstown, as you know. We are including a few objective and reliable sources of information below to correct the record. We hope that you will please take some time to review these materials. Particularly, the presentation by Dr. Anthony Ingraffea will make clear the difference between conventional and unconventional drilling and how unconventional hydraulic fracturing is a new technology. If you want more information, we would be happy to offer educational support to Youngstown City Council and/or the Public Utilities Committee. It would be good to have an open forum where these kinds of presenter misrepresentations, whether intentional or unintentional, could be corrected during the meeting, rather than the day afterward. And, again, thank you for the opportunity to voice our questions and concerns. Thank you in advance for reviewing this material. RE: The presenter mentioned Frac Focus as a resource for Council. Here is a recent Bloomberg article about Frac Focus. “Seeking to quell environmental concerns about the chemicals it shoots underground to extract oil and natural gas, Apache Corp. (APA) told shareholders in April that it disclosed information about “all the company’s U.S. hydraulic fracturing jobs” on a website last year. Actually, Apache’s transparency was shot through with cracks. In Texas and Oklahoma, the company reported chemicals it used on only about half its fracked wells via FracFocus.org, a voluntary website that oil and gas companies helped design amid calls for mandatory disclosure." Bainbridge Township -- A natural gas explosion that rocked an English Drive home early Saturday will be the topic of a meeting at town hall tonight. The freak explosion - which officials say was caused by natural gas bubbling into Richard and Thelma Payne's well water - literally lifted the English Drive house off its foundation before dropping it down, Fire Chief Brian Phan said. " Professor Ingraffea has received numerous awards for his outstanding teaching at Cornell. He received the first Society of Women Engineer's Professor of the Year Award in 1997, the 2001 Daniel Luzar '29 Excellence in Teaching Award from the College of Engineering, and, in 2005, was named Weiss Presidential Teaching Fellow at Cornell University. He has been a leader in the use of workstations and information technology in engineering education, with grants from the NSF, U.S. Department of Education, Digital Equipment Corporation, Sun Microsystems, and Hewlett-Packard in these areas. He organized and was the first Director of the NSF-supported, $15M Synthesis National Engineering Education Coalition, a team of eight diverse engineering colleges. Synthesis developed, implemented, and assessed innovative programs and technologies to improve the quality of undergraduate engineering education and to attract and graduate larger numbers of women and under-represented minority engineers. He was Cornell Co-PI on a NASA/NYS/AT&T sponsored project to develop an Advanced Interactive Discovery Environment for collaborative distance design in engineering education, teaming with faculty from aerospace, mechanics, and civil engineering from Cornell and Syracuse universities. 1. 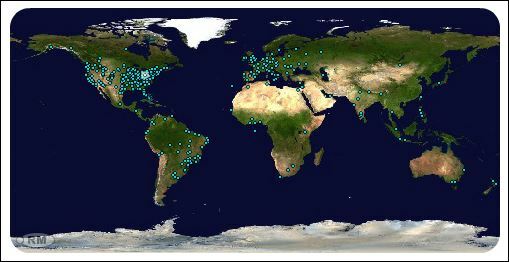 Outreach via informal education of the public, policy makers, and regulators on technical issues related to unconventional development of natural gas. Howarth, R., R. Santaro, Anthony R Ingraffea. 2012. "Venting and Leaking of Methane from Shale Gas Development: Response to Cathles et al." Climatic Change . Hochhalter, JD, DJ Littlewood, MD Veilleux, JE Bozek, AM Maniatty, AD Rollett, Anthony R Ingraffea. 2011. "A geometric approach to modeling microstructurally small fatigue crack formation: III. Development of a semi-empirical model for nucleation." Modelling and Simulation in Materials Science and Engineering 19 (3): 035008. Spear, A., A. Priest, J. Hochhalter, M. Veilleux, Anthony R Ingraffea. 2011. "Surrogate modeling of high-fidelity fracture simulations for real-time residual strength predictions." AIAA Journal 49 (12): 2770-2782. Santoro, R., Robert Warren Howarth, Anthony R Ingraffea. 2011. "Indirect emissions of carbon dioxides from Marcellus shale gas development". A technical report of the Agriculture, Energy, and Environment Program at Cornell University. This is not solely an issue for Mayor Sammarone and the Youngstown City Council to decide without adequate due diligence that consists of open, public, preferably televised, dialogue, among independent scientists, physicians and other health professionals, public health officials, the general public, lawyers, mortgage and insurance experts, and industry and business representatives. Immediate increased transparency and public dialogue is necessary to safeguard the public interest. 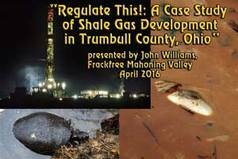 Frackfree Mahoning Valley urges all Youngstown and surrounding area citizens to please attend the public meeting at Youngstown City Council on Wednesday, September, 19, 2012. The adverse risks of fracking and related processes to the public health, safety, and well-being are too great to force them upon the public. Wherever there is fracking there must be millions of gallons of toxic fracking wastewater produced. What are Youngstown’s plans to identify, test and dispose of this waste and other solid fracking waste? It must go somewhere, and Ohio seems to be the state most preferred for dumping or disposal of Ohio’s or other states’ hydraulic fracturing – related waste. If the greenlight is given for fracking in the city, this will by definition mean that more waste in the Youngstown area will be created. Where will it go? What are the plans for disposal? It has been established that the December 31, 2011, 4.0 magnitude earthquake that shook Youngstown, Ohio and was felt in numerous surrounding states and as far away as Canada, was linked to a fracking waste disposal deep injection well. The Youngstown earthquake of December 31, 2011, was one of about 12 earthquakes in an area that never had reported earthquakes before the drilling. The fact that surrounding states as well as areas in Canada reported feeling that 4.0 mag. 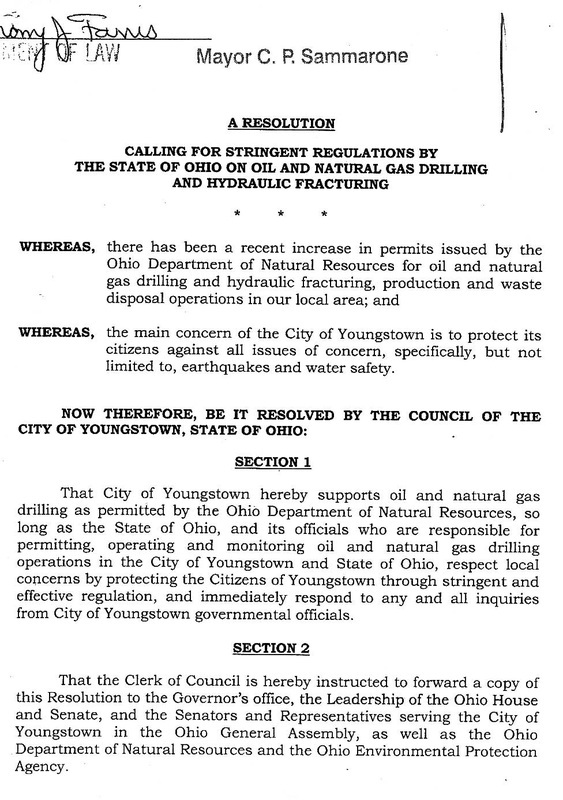 earthquake, makes the decision that Mayor Sammarone and Youngstown City Council regarding whether or not to allow fracking and related processes in the city, an issue for all of the citizens in those states or province, as well as Ohio. Have they been officially consulted? Not as far as we know. It is irresponsible to allow fracking and/or disposal of fracking waste in the city for the latter fact alone. There are too many unknowns about where geological faults lie and how to actually prevent fracking-related earthquakes. Injection wells in the earthquake – related moratorium areas must not be started again. Fracking waste disposal in those areas, at least, must be permanently banned. In addition, the so-called “brine” “saltwater” fracking waste must be independently, publicly, completely, and scientifically tested for all components of this substance. “Stringent regulations” did not prevent the earthquakes, or other accidents that have taken place recently in Youngstown or the surrounding area. One cannot make an inherently unsafe process safe by making more regulations. For example, asbestos was once thought to be safe for use by the public. Science later showed that asbestos is inherently unsafe. No amount of “strict regulation” will make asbestos safe. This is the same with fracking and related processes. They are inherently unsafe and no amount of regulations will make them safe. The following fracking – related accidents are not theoretical. This is happening now and must be adequately addressed. These incidents still remain unresolved. If these kinds of spills or accidents are already happening before fracking and related processes are even taking place on a large scale in Ohio, what kinds of health risks and threats to drinking water will the general public face if the industry ramps up full speed ahead? It must be delayed now. -Fish die in a Brookfield, Ohio pond. What exactly caused countless fish to die? Consol Energy was cited by the EPA in relation to the runoff, according to the WKBN TV News report. “D&L faced violations in its past” Published: Mon, January 2, 2012 @ 12:03 a.m., by Karl Henkel, The Vindicator. -The Ginsburg well. An Ohio well reported as having numerous serious violations is reportedly still operating. These kinds of incidents do not inspire public confidence in the Ohio Department of Natural Resources (ODNR) or other Ohio officials’ ability to safely regulate the gas and oil industry. These serious accidents make assurances given by officials regarding “stringent regulations” sound like false reassurances. Even small human errors can cause highly damaging consequences. Drinking water sources and public health should not be put in jeopardy. The following news articles include information about why these kinds of decisions cannot be rushed through council without adequate due diligence and public notification of what is going on in their communities. The public must have a real opportunity to voice their feedback and concerns. An astounding example of the lack of thinking things through adequately when it comes to permitting fracking and related processes in Ohio is the drilling in the watershed of the Meander Reservoir. 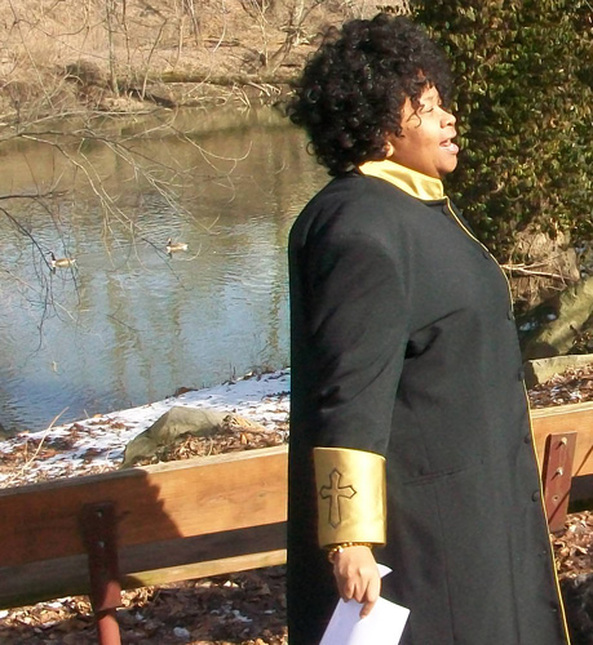 This reservoir is a drinking water source for 300,000 citizens in our Mahoning Valley. Preparation for drilling has already begun. This turn of events and the site chosen near Meander is astonishing, especially in light of a news report from Westmoreland County, Pennsylvania, in August of 2012, where, according to Timothy Puko of the Tribune – Review, cited below, “A gas-drilling site leaked sediment above a drinking – water reservoir in Westmoreland County, leading state environmental regulators to issue a violation notice.” (8/1/12) The driller was reported to be Consol Energy, according to the news article. Details about the drilling near Meander Reservoir and the location of the well “in the Meander Reservoir’s watershed”, according to the Tribune – Chronicle, are included in the following Tribune Chronicle article (9/14/12). According to the Tribune – Chronicle article, CNX Gas Co. LLC is the driller of the horizontal well. 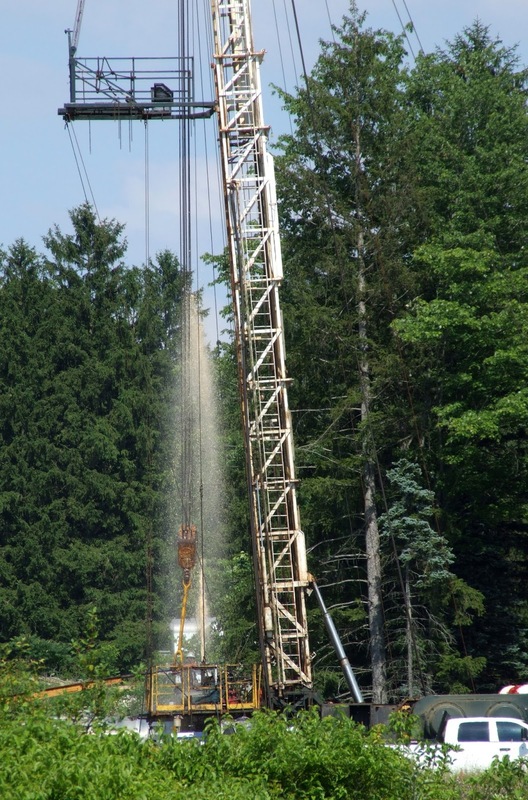 The Marcellus Drilling News reports that the watershed well “…is being drilled by CNX Gas (subsidiary of CONSOL Energy)”, which reportedly was issued a violation notice in the above-mentioned article describing the Westmoreland County, Pennsylvania, drilling leak incident. Is this the same company that will soon be drilling in the Meander watershed? This needs to be made clear. The public needs to know. There is an urgent and great need to slow this entire process down while people educate themselves and learn the truth about what is going on in their residential neighborhoods when it comes to the gas and oil industry drilling. Drilling has even commenced or is being considered as an option near cemeteries, schools, homes, forests, and parks in various parts of the country. Frackfree Mahoning Valley believes that promises of quick money for leasing mineral rights by the oil and gas drilling industry are clouding some peoples’ judgment regarding the dangers of fracking and related processes. Issues such as gas drilling- related eminent domain and mandatory or forced pooling need to be fully understood by the general public. There is too much rushing to drill without the public’s full knowledge. On too many occasions, the public is caught off guard by how swiftly drilling activities are moving into their neighborhoods near homes and schools. This is not right and must stop. Articles that address other states’ experiences with fracking and related processes show that even strict regulations are not always enforced. Ohio is not adequately prepared to police spills, leaks, mechanical failures, and accidents that are already beginning to occur. First responders, health professionals, and the general public need to know what exactly is in the fracking “brine” waste. We in Ohio should be learning from residents’ experiences in other states with fracking and related processes rather than some people or officials ignoring or remaining unaware of other states’ problems and damages related to gas drilling and plunging blindly and recklessly, full speed ahead. This is foolish and irresponsible. It is a disservice to the community and a threat to public health and safety. These are just a few of the reasons why Mayor Sammarone and Youngstown City Council must delay the vote on fracking in Youngstown, Ohio, on Wednesday, September 19, 2012. If this vote is not delayed in order for the Youngstown City Council to continue to do additional proper study and due diligence and to properly inform the general public of the serious risks of fracking and related processes to the public health, safety, and well-being, Frackfree Mahoning Valley believes that such apparent willingness to rush into an agreement for oil and gas industry drilling or fracking in Youngstown, without adequate due diligence, will show that Mayor Sammarone and Youngstown City Council are not adequately protecting the public’s health, safety, and well-being. The health of our communities, citizens, families, and future generations must take priority in any decision-making regarding fracking and related processes. Too much is at stake for irresponsible, rash decisions to be made. Delay the vote. It is the right thing to do. Subscribe to our Rally Updates - news, ideas, logistics! 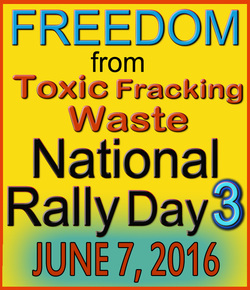 Are you concerned about toxic fracking waste or fracking waste injection wells? Where do millions of gallons of fracking waste go and what exactly is in it? Are you concerned about fracking waste-related earthquakes, spills, leaks, or mechanical failures and their serious implications for the public health, safety, and well-being of our families and our local communities? If you share these concerns, you are not alone. UPDATE #7: "More Media Tips"